SPYRAL Double Helix is pretty much the perfect link monster this early in the link game. He (they?) has everything you would want. It’s Link 2 using easily summoned material, high attack for its link number, the perfect arrows you want in order to summon him either in the extra zone or in the main zone, and an effect that lets you plus and further your plays. Now I know SPYRALs just got the snot beat out of them by the e-ban list, but that had to happen. This deck has been so dominant the past month that playing other decks in tournaments has been a laughable exercise in futility. So where does that leave SPYRALs? Well, I believe they’re still actually in a good place. Since True Kings, dinos, and zoodiacs have all been completely dismantled, there’s still reason to believe SPYRALs can stay on top, and Double Helix is a big reason why. Even though Quik-Fix was by far the best monster in the lineup, the card wasn’t banned and last time I checked, his effect is still not once per turn. And with various ways to easily search or dump Quik, there’s no reason why he can’t still be utilized in every facet of SPYRAL decks. So Double Helix will still have access to his favorite target or any other monster necessary to make plays. And now SPYRALs have room for the three machine dupes that won’t be used anymore. In my opinion they just got downgraded from silly back to scary. Unfortunately, Double Helix probably doesn’t have a great future. Like Kozmos, SPYRALs have their short day in the sun and then it’s on to the next new thing. And since Double Helix requires two SPYRALs to summon and his effect is only for his own archetype, he goes as his deck does. So, enjoy 2017, my friends. The spy game is almost up. SPYRAL Double Helix finishes out the week for CoTD, the card that launched the SPYRAL Invasion. Easy to summon in the archetype, combos well with SPYRAL support as it takes on the same of SPYRAL Super Agent. Same effect as Super Agent, except instead of a Special Summon of itself, this time you get a SPYRAL monster from your deck or grave to your hand or Special Summon it to a zone Double Helix is pointing to. Once per turn is more than enough for this effect. The deck is geared to reuse and recycle Quik Fix at will, and this will give you back a copy of Quik Fix without having to discard a card. Even if you don’t call it right you will be seeing their next card, and that can help you plan what you will do next (no one likes being the victim of a Twin Twister/MST the opponent just drew after they set their best spell/traps). This deck is Tier 0, and while it can be beaten, it is so fast and this card makes it faster. Without Double Helix I think the deck would still be top, but not like it is right now. Even when countered they can still power through. Like a good spy, SPYRAL Double Helix is more than meets the eye. They are a Link 2 Earth Warrior-type Link Monster with 1900 Atk and L and B Arrows. They become SPYRAL Super Agent on the field or in the grave. Then you get to reveal the opponent’s next card once per turn and if you call it right gain a search of a SPYRAL Monster or Special Summon it from the deck or grave. SPYRAL Double Helix is very deck specific, obviously, and is only as good as the monster it searches/Special Summons. Since at the moment, those choices are ridiculously awesome in a very fast deck, this will score high. If the ban list takes another swing, SPYRAl Double Helix will be burnt faster than you can say Kozmo. Thanks to this card, we are now in a Tier 0 format, so I find it odd that it only got the #6 slot this week. 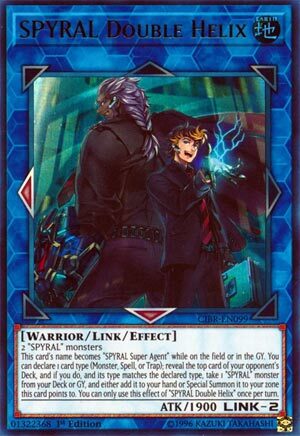 This card helped SPYRAL get to the next level because they already were good, but needed the card to take them to the meta, and now SPYRAL Double Helix is here to make the deck straight up Tier 0. SPYRAL Double Helix is a Link-2 that points Bottom and Left, and requires 2 SPYRAL monsters as material. The Link Monsters might not be efficient in summoning Extra Deck Monsters, but it does make the effect live in the Main Monster Zone or Extra Monster Zone. On the field or in the GY, this card is treated as SPYRAL Super Agent, which is key to using some of the SPYRAL monster effects like SPYRAL Quik-Fix in the GY. As a hard Once Per Turn, you can declare one card type (Monster, Spell, or Trap) and look at the top card of your opponent’s deck. If it is what you declared, you can take a SPYRAL monster from the Deck or GY and either summon it to a zone Helix points to or add it to your hand. Well now we got a much better way to summon SPYRAL Master Plan, who can get you a search, especially for SPYRAL Resort. Thanks to this card, SPYRAL can generate a ton more advantage than Quik-Fix and Machine Duplication already generated. SPYRAL Double Helix, this is a good card as well, though one I ignored from my list because I don’t like (or try not to include) Deck specific cards in my list (and yes I put Amazoness Empress in mine). I try to keep my list more to the splashable cards, but that’s just me. This is a Link 2 Monster with a requirement of two SPYRAL Monsters. 1900 attack isn’t bad for a Level 4, it has all the pros of being a Warrior as well. So first off, you get to choose a type of card (Monster, Magic or Trap) and reveal the top card of your opponent’s Deck. If you’re right in your prediction, you get to add a SPYRAL Monster from your Deck or Graveyard to your Hand, OR Special Summon it to the Field in a Zone this card points to. That’s where the zones become important, with the arrows being beside and below, in this case. This Monster is just making a fast Deck faster, and easier to gain advantage. It’s almost too good, in my opinion.